"Practical, meaningful, and highly enjoyable. There are not many books out there for teenagers with diabetes. In Control fills a gap and really meets that need." --JoAnn Ahern, RN, MSN, CDE Pediatric Diabetes Clinical Nurse Specialist, Yale University * Books to Fund a Cure * A portion of this book's proceeds will go to the Juvenile Diabetes Foundation International, a not-for-profit voluntary health agency, whose primary objective is to support and fund research to find the cause, cure, treatment, and prevention of diabetes and its complications. Juvenile Diabetes Foundation Library Illustrator P.S. Mueller's cartoons appear in more than 30 major city weekly newspapers throughout the country and in such magazines as Harper's, Health, The Esquire Gentleman, Hippocrates, and The Utne Reader. About Susan Thom (Author) : Susan Thom is a published author of children's books and young adult books. 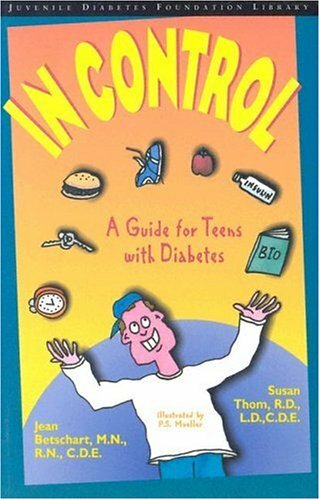 Published credits of Susan Thom include In Control: A Guide for Teens With Diabetes.